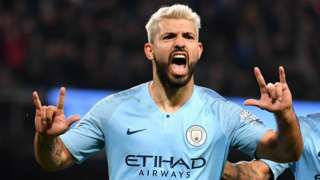 Man City remain one point behind Liverpool at the top of the Premier League as Sergio Aguero's second-half penalty secures a deserved win over West Ham. Three points for Man City, who remain one point behind Liverpool in the standings. Phil Foden plays in Ilkay Gundogan, who tries to cut the ball back to the Man City substitute. It's cut out by a West Ham defender, however. Is that the title smell? Yesterday, Pep Guardiola said he didn't care about performances now, he just wanted to know his Manchester City players could smell the title. This has not been particularly easy on the eye but, thanks to a very debatable penalty, City are about to collect another precious three points. Must smell good to Guardiola. There will be four minutes of second-half stoppage time at Etihad Stadium. Time for one final opening, perhaps? Michail Antonio is shown a yellow card for West Ham. The midfielder has shaken off that earlier injury but hasn't been involved much since. Standing ovation for goalscorer Sergio Aguero, who comes off for Phil Foden. City are looking comfortable. West Ham look beaten. Andy Carroll heads well wide from a promising position. Nothing to worry about for Ederson in the City goal. Pep Guardiola is getting a bit anxious. After watching his team play a needless pass out for a throw-in, he spun round and arched his back in a combination of disbelief and frustration. He is prowling along his technical area liked a caged lion, occasionally returning to his seat to express some complaint to his coaching staff, then immediately returing to where he has come from. Ten minutes of normal time left to play at Etihad Stadium. City have had 19 shots, West Ham have had one. Excellent play by Bernardo Silva once again. The 24-year-old sets up Raheem Sterling inside the area, but the England international fires well wide of Lukasz Fabianski's goal. Felipe Anderson, who fouled Bernardo Silva for the City penalty, comes off for 20-year-old attacking midfielder Grady Diangana. The former Lazio man has failed to trouble City's rearguard this evening. Grady Diangana is about to come on for the Hammers. City will remain one point behind Liverpool at the top of the Premier League. UNLESS West Ham can find a goal from somewhere in the next 20 minutes or so. Bernardo Silva, who has been excellent since coming on, tees up Danilo, whose low shot is well held by Lukasz Fabianski. Good effort by the full-back, but the Hammers custodian was equal to it. The Man City midfielders are passing the ball among themselves near the centre circle. There hasn't been much in the way of a West Ham response. They have just over 20 minutes of normal time to salvage something from the game. Lukasz Fabianski - who hasn't done an awful lot wrong this evening - punches clear a Raheem Sterling effort from the edge of the box. It's taken a while, but the City fans have finally found their voice. So close to a second Manchester City goal. Lukasz Fabianski makes a fine save to deny Raheem Sterling, before David Silva's effort on the follow-up is blocked on the line by Ryan Fredericks. Bernardo Silva heads over the crossbar moments later. There were a few resigned looks on the faces of West Ham players when referee Stuart Atwell pointed to the spot then. It was a soft penalty but is one of those big clubs tend to get and smaller clubs don't. Brilliant reception for Pablo Zabaleta after being introduced as a West Ham substitute. Zabaleta is a true club legend here. The Hammers make their second change, and it's a popular one. Debutant Ben Johnson comes off for former City man Pablo Zabaleta, who receives a warm applause from the home faithful.